Drawing lessons from the Treaty of Westphalia, the authors offer fresh thinking on how to treat the legacies of the post-Ottoman state system. It was the original forever war, fuelled by religious fanaticism, personal ambition, fear of hegemony, and communal suspicion. It dragged in all the neighbouring powers and went on interminably. It was punctuated by repeated failed ceasefires. It inflicted suffering beyond belief and generated waves of refugees. No, this is not Syria today, but the Thirty Years’ War (1618–48), which turned Germany and much of central Europe into a disaster zone. The Thirty Years’ War is often cited as a parallel in discussions of the Middle East. The Peace of Westphalia, which ended the conflict in 1648, has featured strongly in such discussions, usually with the observation that recent events in some parts of the region have seen the collapse of ideas of state sovereignty—ideas that supposedly originated with the 1648 settlement. Milton, Axworthy and Simms argue that the Westphalian treaties, far from enshrining state sovereignty, in fact reconfigured and strengthened a structure for legal resolution of disputes, and provided for intervention by outside guarantor powers to uphold the peace settlement. 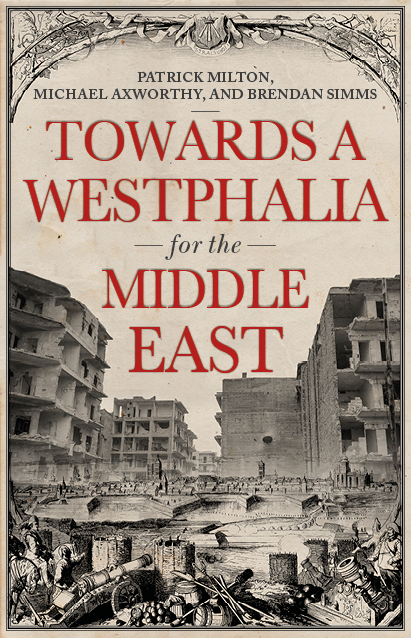 In their analysis the history of Westphalia may hold the key to resolving the new long wars in the Middle East today. Patrick Milton is a Research Fellow at Peterhouse, University of Cambridge, working on the 'Westphalia for the Middle East' project and on early modern Europe. Michael Axworthy is Senior Lecturer at the University of Exeter and author, inter alia, of Revolutionary Iran. Brendan Simms is Professor in the History of International Relations, University of Cambridge and author, inter alia, of Europe: The Struggle for Supremacy, 1453 to the Present.